WordPress sends some great stats on the blog at the end of the year. Our blog was viewed about 40,000 times over the past year. Of course that is not individuals, but the number of views. Probably 1/3 of those views are mine. We had 283 new posts, and the longest stretch of daily posts we had was 14 days. I may have stolen 200 of those posts from the Diospi Suyana Hospital webpage. We had visits from 100 different countries. Most of them from the United States, but also a lot from Canada and Peru. Somehow we had 2 hits from Saudi Arabia. It is not surprising to know that my mother was the most frequent commenter. Thanks Mom! In addition, a few of our posts were more popular. Our friend Ryan Morigeau takes great pictures, and one of our posts, The Dignity of Man shows how his photos can show the inalienable value of each individual. Whenever Allison puts up a recipe or posts something, it is bound to be popular. She put up a post called Mennonite Muffins that was found by a website amish365.com that referred lots of visitors to our site. Please Pray on Sundays shared some of our struggles on sunday mornings. I really liked and was challenged by her post Take a Love Risk for Someone You Don’t Really Know. You can tell when Allison writes a post, because it will give you something to think about. My posts generally have information with less food for thought. I blogged about work several times, and some of the more interesting and viewed posts were stories of busy call days. Friday Night Call shared the story of an unexpected ambulance visit to the hospital. Trauma shared the story of one of the worst trauma cases I have been a part of, here or in the US. A Day in the ER with Pictures has more great photos of me working taken by our friend Ryan. Of course as a parent, I love posts about our kids. They had some tough transitions as we dropped them into school that was completely in Spanish. But they did well, even excelling at times. Some of the more interesting posts of the kids are the ones that show them in a new cultural context with the school. Dia de Independencia de Peru has a lot of good photos. Taller de Culturas explains some of the extracurricular activities of the school year. We are thankful for our friends. You can go to their blogs which have their own interesting statistics. You can find their blogs on the sidebar of our webpage. This is our little community of American missionaries here in Peru celebrating the Fourth of July in the southern hemisphere. (There are also in this picture 1 Peruvian, 1 German, 1 Dutch, and a family visiting from the US as well as our two Worldwide Witness students we had this past summer, Lydia and Austin. There are not really that many of us!) They help us pull of crazy ideas like Cafe Caire and they inspire us to live more humbly and with a servant attitude. And we are thankful at the end of the year for everyone who looked at our blog, for everyone who remembers us back home and prays for us and supports us, and for strangers who have come, guided from some webpage or by a google search. We hope and pray that you all will know the grace and love of God that surpasses all understanding in this coming year. The greatest miracles of God are changed lives. See this post from the Hospital Diospi Suyana website. Marcos Acuna tells his story and a little later he is signing his contract. That was yesterday. Today, he will be traveling in southern Peru for Diospi Suyana. On foot, by car, and by bus. Flashback: Marcos is enjoying life. He plays his guitar in a band and goes with the flow. He regularly lightens his mood with cocaine and marijuana. His clothes and long hair show that he is not interested in a consistent career or place of residence. 2009: One day he finds himself in the possession of a Bible. He begins to read page one. Each word is etched in his imagination. He continues reading until 1200 pages later he is sure that he needs forgiveness and help. Jesus Christ is the answer to his quest for meaning and fulfillment. He confides in God and begins to pray; this is how the miracle begins. He is now free from the drugs. He will no longer touch the stuff. A year later he cuts his hair and begins a four-year theological education. His brother is an alcoholic, his father, a radical communist. The changes in the life of Marcos make a deep impression on his family members. One after the other, they come to Christ. His brother no longer drinks and his father has changed his world view. On Sundays they attend a church service together in a Protestant church. Wednesday, 2:30 PM. Marcos has signed his contract and is happy with his steady job at Diospi Suyana. He will visit former Diospi Suyana patients in southern Peru and inquire about their condition. Of course, he also wants to talk to them about their faith in God and share his own experiences. The hospital pastor, pastor Santos (left), wants to guide and encourage him in his work. This is no easy mission for Marcos. He will often have to walk for hours through the mountains as far as his feet will carry him. Heat and frost, snow and rain will be his faithful companions. One more reason to give him to the care of God. 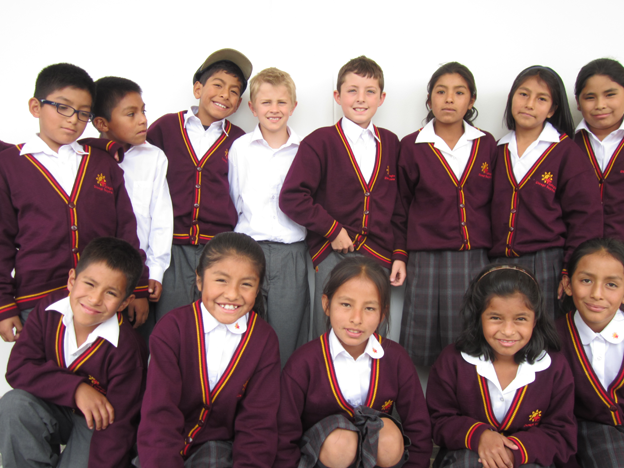 A local online magazine published an article about our little school here in Curahuasi. Here is the first part of the article, with a picture including one of the best and brightest students in the school, front and center. At the bottom is a link to the full article which also has some pictures by our friend Ryan Morigeau. A district in the Apurimac region, Curahuasi has become the home to an innovative school and healthcare system thanks to a program run by a German couple. Apurimac is a region one doesn’t hear much about despite its proximity to Cusco. Tourists – Peruvians and foreigners alike- tend to visit neighboring regions like Ayacucho, Cusco or Arequipa, rather than visit the land where ‘God talks’ – ‘Apu’ for God and ‘Rimac’ for talking. Likewise, most of the international assistance, including volunteer work by enthusiastic young men and women, goes inevitably to the Cusco Region. Nothing wrong with that, but perhaps we can take a closer look at Apurimac where assistance could translate into improved livelihoods of the local population, and be very much rewarding for the soul. . . .
You can read more at Diospi Suyana: A Miracle for Curahuasi from the online magazine PeruThisWeek. We had a great time! The day was spent it with Lyndal from Australia, John and Viola Lentink from the Netherlands and Germany, and the evening was passed with our now traditional Christmas viewing of The Sound of Music. Allison worked very hard all day, cooking, being happy, and giving us all a great Christmas meal. We ate Alpaca steaks with the traditional sides for a Christmas turkey (stuffing, sweet potatoes, green beans, etc). It all went surprisingly well together. The Alpaca was from one of the hospital Alpacas that are kept to trim the grass. The herd has grown, and it had to be thinned to maintain genetic stability. As you might guess, the kids like the Alpacas and they have even given names to them. So they were all hesitant to eat any of the meat, realizing that they were eating their “pets”. Dessert was Pavlova, an Australian tradition, as well as apple pie and cinnamon ice cream! I hope everyone had a great Christmas. We were sad to not be home, but glad to be here with so many new, good friends. We had a wonderful church service today. 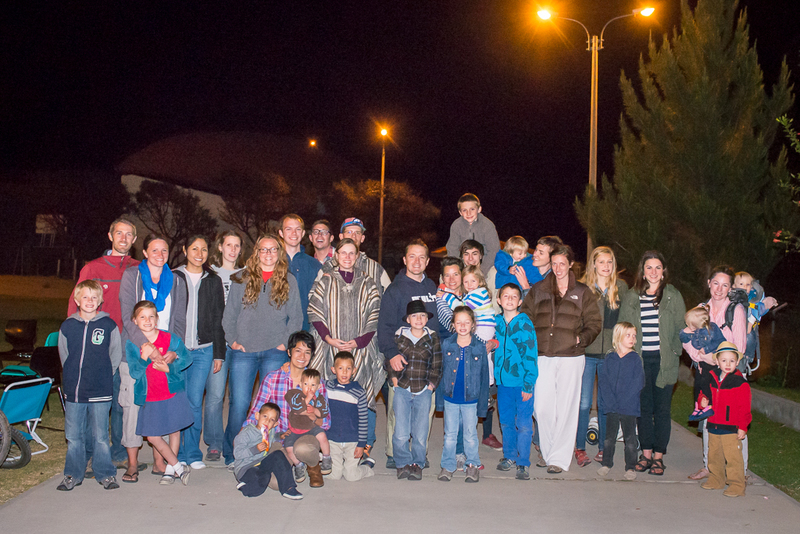 We had a large attendance of both Peruvians and missionaries. It is amazing how the people will show up when breakfast is provided. Allison and her friend, Damaris Hassfeld, worked on gifts for all the kids. Thanks again to our friend Deb Pullen we had ball caps to give to all the older kids, and beach ball globes to give to the younger ones. We then filled christmas bags with candy, pencils, stickers, and other fun things. As often happens in these type of events, more kids showed up than expected, and our kids sat out the gift receiving time and watched as the other kids enjoyed their presents. They took it in stride, but as a parent you wonder how they feel when they are always the ones making the sacrifice of fun. I assured them we would make it up to them in four days. We shared a breakfast with all the members of the church, and since there is no school now, that meant that there was no homework waiting for us at the house. So we could relax and take our time with everyone without concerns of how many hours we would be at the kitchen table later. We are looking forward to our Christmas week. I hope everyone out there is having a Merry Christmas. Agustin gives some thoughts on Navidad. Thanks to Deb we now have new Frisco Roughrider fans. Worried about the season it looks like. Did you send out Christmas cards? Enjoying an early Christmas present. Early Christmas! Thanks Deb Pullen.